Le Club Accorhotels has triple points offer with breakfast for one stay at any of the eight Mercure hotels in Poland between April 1 – May 31, 2015, that is booked after March 1. You must book the “Sweet Secret by Mercure” rate and register for this offer before you can earn triple points for the stay. Note that this offer has minimum stay requirement of two nights and that you can earn triple points only for ONE stay. This offer can make sense as long as the “Sweet Secret by Mercure” rate is not inflated (as the terms and conditions require you to book it). 1. 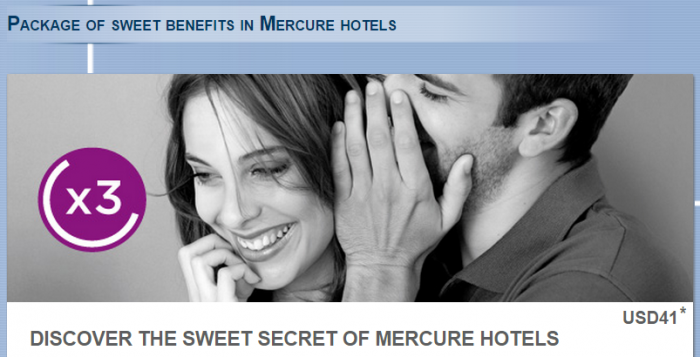 General Le Club Accorhotels Terms and Conditions apply to the “Discover the Sweet Secret of Mercure hotels” offer. 2. This offer is valid for a stay from 1.04.2015 and 31.05.2015 in one of the participating Mercure hotels in Poland, booked between 1.03.2015 and 31.05.2015 based on the “Sweet Secret by Mercure” rate . 3. The stay must be a minimum of 2 nights. 4. This offer entitles Le Club Accorhotels Loyalty members, regardless of their status, to benefit from earning triple points in one of the participating hotels in Poland. 6. To benefit from this offer, your booking must be made on Accorhotels.com or our participating brands web sites, via the accorhotels.com application or via Accor call centres. All other reservation channels will not be eligible to this offer. 12. The bonus points will be credited only to the members who subscribed to the offer before their stays. 13. You may benefit from this one (1) time.